Americans continue to hold the military in high regard, with more than three-quarters of U.S. adults (78%) saying that members of the armed services contribute “a lot” to society’s well-being. That’s a modest decline from 84% four years ago, the last time the Pew Research Center asked the public to rate various professions. But the military still tops the list of 10 occupational groups, followed closely by teachers, medical doctors, scientists and engineers. A solid majority of the public says each of those occupations contributes a lot to society. While there have been modest declines in public appreciation for several occupations, the order of the ratings is roughly the same as it was in 2009. Among the 10 occupations the survey asked respondents to rate, lawyers are at the bottom of the list. About one-in-five Americans (18%) say lawyers contribute a lot to society, while 43% say they make some contribution; fully a third (34%) say lawyers contribute not very much or nothing at all. Compared with the ratings four years ago, journalists have dropped the most in public esteem. The share of the public saying that journalists contribute a lot to society is down 10 percentage points, from 38% in 2009 to 28% in 2013. The drop is particularly pronounced among women (down 17 points). About as many U.S. adults now say journalists contribute “not very much” or “nothing at all” to society (27%) as say they contribute a lot (28%). These are some of the findings from a survey by the Pew Research Center’s Forum on Religion & Public Life conducted March 21 to April 8, 2013, among a representative sample of 4,006 adults nationwide. The margin of error for the survey is plus or minus 2.1 percentage points. On balance, public perceptions of the military and teachers are overwhelmingly positive. Fully 78% of adults believe that members of the military contribute a lot to the well-being of society, and 72% say the same about teachers, while about one-in-ten or fewer say those occupations contribute not very much or nothing at all to society. Roughly six-in-ten or more adults also say that medical doctors (66%), scientists (65%) and engineers (63%) contribute a lot to society. As with the military and teachers, negative perceptions of these occupations are comparatively rare. Ratings of other groups are more mixed. Clergy are in the middle of the occupations considered, with 37% saying they contribute a lot to society, followed by artists (30%), journalists (28%), business executives (24%) and lawyers (18%). Majorities of the public say that all these occupations make at least “some” contribution to society’s well-being. But the balance of perceptions becomes more negative toward the bottom of the list, with a quarter or more of respondents expressing the view that journalists (27%), business executives (28%) and lawyers (34%) contribute not very much or nothing at all to society. The ratings of these occupational groups are largely in keeping with what other surveys have found about public confidence in the leaders of various institutions. The 2012 General Social Survey (GSS), for example, asked a nationally representative sample of adults to rate their confidence in the people running a variety of institutions. More people expressed confidence in the military than in any other institution considered (55% have a great deal of confidence in military leaders), followed by leaders of the scientific community and medicine. Ratings of religious leaders were in the middle of institutions considered; a fifth of adults said they had a great deal of confidence in leaders of “organized religion” in 2012. Far fewer expressed a great deal of confidence in leaders of “television” (10%) and “the press” (9%). On balance, the military is viewed positively by all major social and demographic groups. Men and women are about equally likely to see the military as contributing a lot to society. And there are no significant differences in views on the military’s contribution to society among adults younger and older than age 50 or among those with differing levels of formal schooling. Whites are somewhat more likely than either blacks or Hispanics to say members of the military contribute a lot to society. And Republicans and independents who lean toward the Republican Party are somewhat more likely than Democrats and independents who lean toward the Democratic Party to see the military as contributing a lot to society. Public views of medical doctors, scientists and engineers are largely positive, with roughly six-in-ten to two-thirds of U.S. adults saying each group contributes a lot to society. Younger adults (ages 18 to 49) are somewhat more upbeat than older Americans in their assessment of these three occupations. The difference between age groups is particularly pronounced in views of engineers; 68% of 18- to 49-year-olds say engineers contribute a lot to society, compared with 56% of those 50 and older. Americans with a college degree also are more inclined than those with less schooling to say that doctors, scientists and engineers contribute a lot to society’s well-being. Men and women tend to have similar views on these questions. Men are somewhat more inclined than women to see engineers as contributing a lot to society (65% among men versus 60% among women), but there are no gender differences when it comes to the perceived contributions of either medical doctors or scientists. While there are no differences in views of medical doctors by partisanship or political ideology, there are political differences in views of scientists and engineers. Democrats and Democratic-leaning independents are somewhat more inclined than their Republican counterparts to say that scientists contribute a lot to society (69% versus 64%). Political conservatives are less inclined than either moderates or liberals to say that scientists or engineers contribute a lot to society. There are few differences between religious groups in their assessments of medical doctors’ contribution to society, but there are more differences when it comes to the contributions of scientists and engineers. White mainline Protestants, white Catholics and the religiously unaffiliated tend to be more positive about the contributions of scientists and engineers than are white evangelical Protestants, black Protestants and Hispanic Catholics. The perceived contribution of the clergy varies widely across religious groups. White evangelical Protestants are especially positive in their assessments; roughly half (52%) say clergy contribute a lot to society. Hispanic Catholics are less glowing; about three-in-ten (28%) say that clergy contribute a lot to society. As expected, U.S. adults who have no religious affiliation are less likely to see the clergy as contributing to society. A fifth of the unaffiliated say clergy contribute a lot, while 39% say clergy make some contribution and 31% of the unaffiliated say clergy contribute not very much or nothing at all to society. Those who attend worship services more frequently are more positive about the clergy. Among adults who attend services at least weekly, about half (52%) say the clergy contribute a lot to the well-being of society. This compares with about three-in-ten (29%) among those who attend services less often. This pattern holds among most religious groups that are sufficiently large to be analyzed separately. 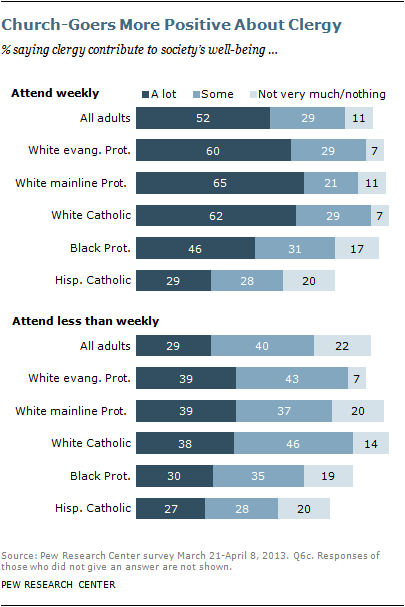 White evangelical Protestants, white mainline Protestants, white (non-Hispanic) Catholics and black Protestants who attend services weekly express more positive views of the clergy than do members of each religious group who attend services less often. 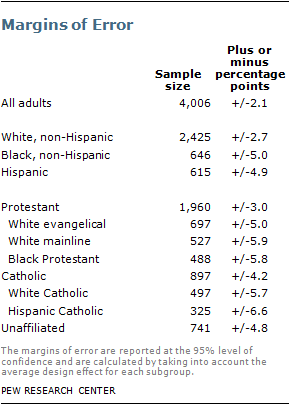 The exception is Hispanic Catholics; there is little difference between the views of Hispanic Catholics who attend church weekly and those who attend less often. In addition, Hispanic Catholics are less likely than other major U.S. religious groups to express an opinion about the contribution of clergy to society. The decline in public views about journalists’ contribution to society since 2009 is more pronounced among women than men. Roughly three-in-ten women (29%) say journalists contribute a lot to society’s well-being, down 17 percentage points from 46% in 2009. Men’s views on this are about the same today as they were in 2009. 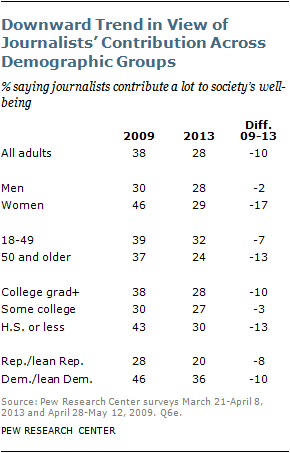 The decline in the perceived contribution of journalists cuts across partisan leanings, age and education level. Democrats and Democratic-leaning independents as well as Republicans and Republican-leaning independents all are less likely to say journalists contribute a lot to society’s well-being today (down 8 points among Republicans/leaning Republicans and 10 points among Democrats/leaning Democrats). This report is based on telephone interviews conducted March 21-April 8, 2013, among a national sample of 4,006 adults, 18 years of age or older, living in all 50 U.S. states and the District of Columbia (2,002 respondents were interviewed on a landline telephone, and 2,004 were interviewed on a cell phone). Interviews were completed in English and Spanish by live, professionally trained interviewing staff under the direction of Princeton Survey Research Associates International. A combination of landline and cell random digit dial (RDD) samples were used to reach a representative sample of all adults in the United States who have access to either a landline or cell phone. Both samples were disproportionately stratified to increase the incidence of African-American and Hispanic respondents. Within each stratum, phone numbers were drawn with equal probabilities. The landline samples were list-assisted and drawn from active blocks containing three or more residential listings, while the cell samples were not list-assisted but were drawn through a systematic sampling from dedicated wireless 100-blocks and shared service 100-blocks with no directory-listed landline numbers. Both the landline and cell RDD samples were disproportionately stratified by county based on estimated incidences of African-American and Hispanic respondents. Several stages of statistical adjustment or weighting are used to account for the complex nature of the sample design. The weights account for numerous factors, including (1) the different, disproportionate probabilities of selection in each stratum,, (2) the overlap of the landline and cell RDD sample frames, and (3) differential non-response associated with sample demographics.